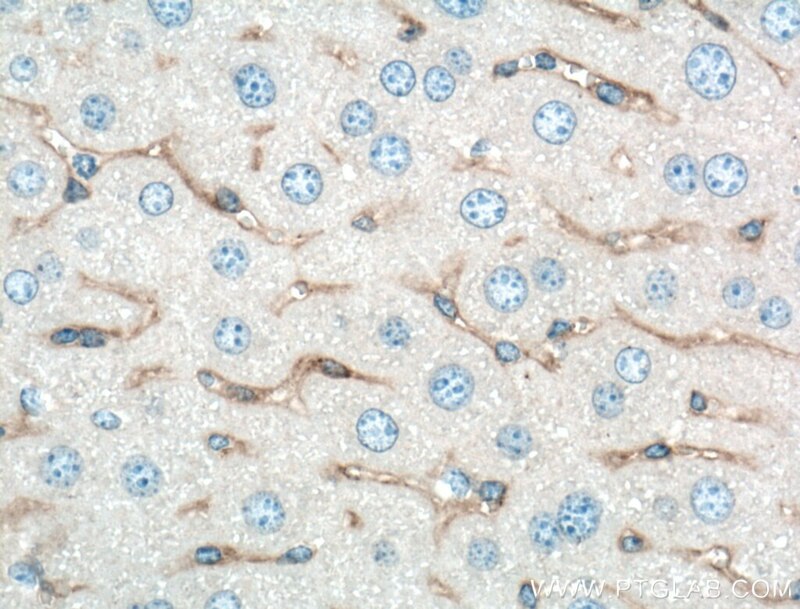 ACTA2, also named as a-SMA,AAT6;ACTSA belongs to the actin family. 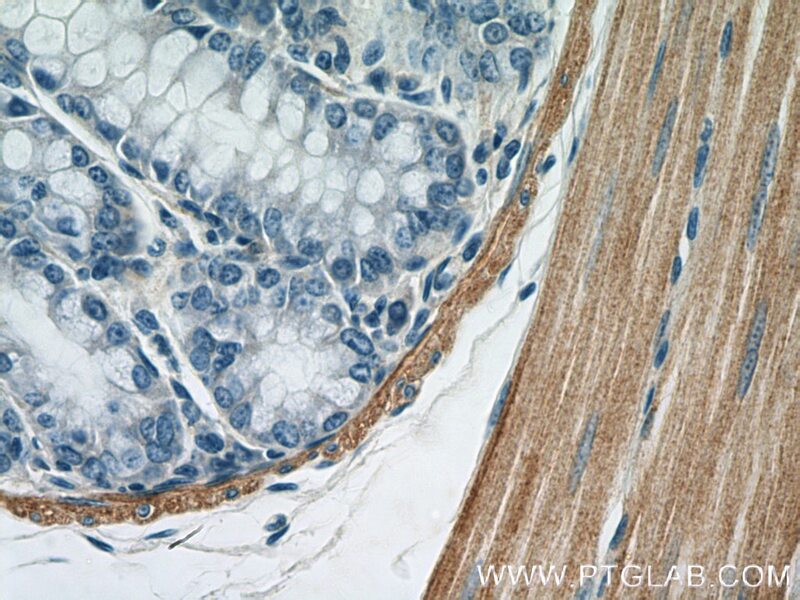 Actins are highly conserved proteins that are involved in various types of cell motility and are ubiquitously expressed in all eukaryotic cells. 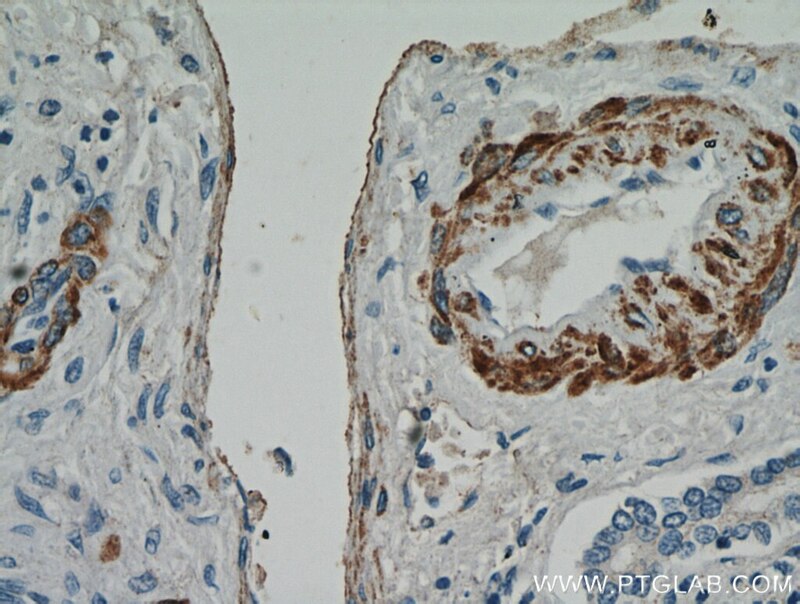 Defects in ACTA2 are the cause of aortic aneurysm familial thoracic type 6 (AAT6). 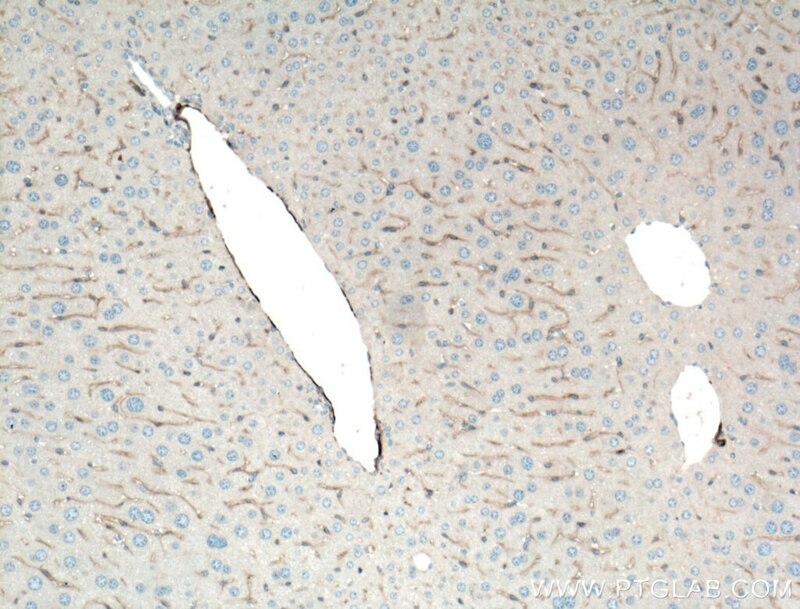 The immunogen of this antibody is a specific domain of ACTA2. 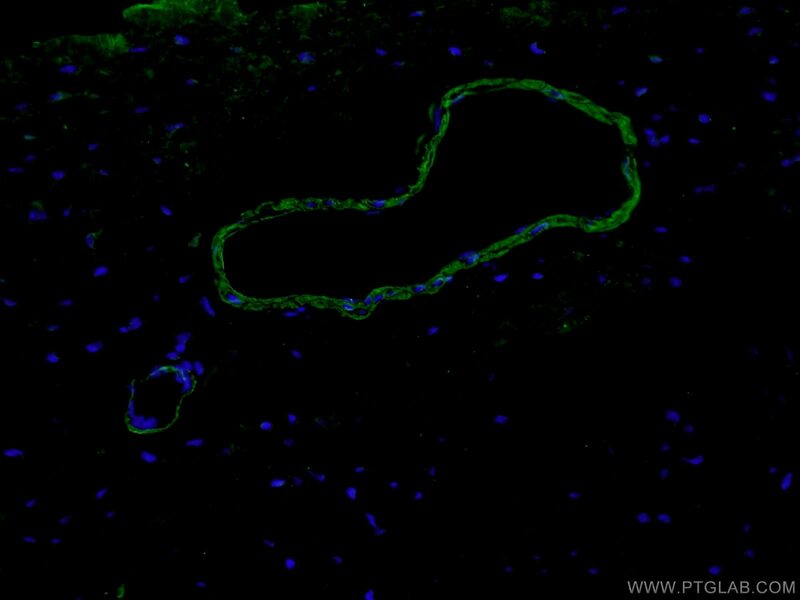 This antibody stains the aorta only. 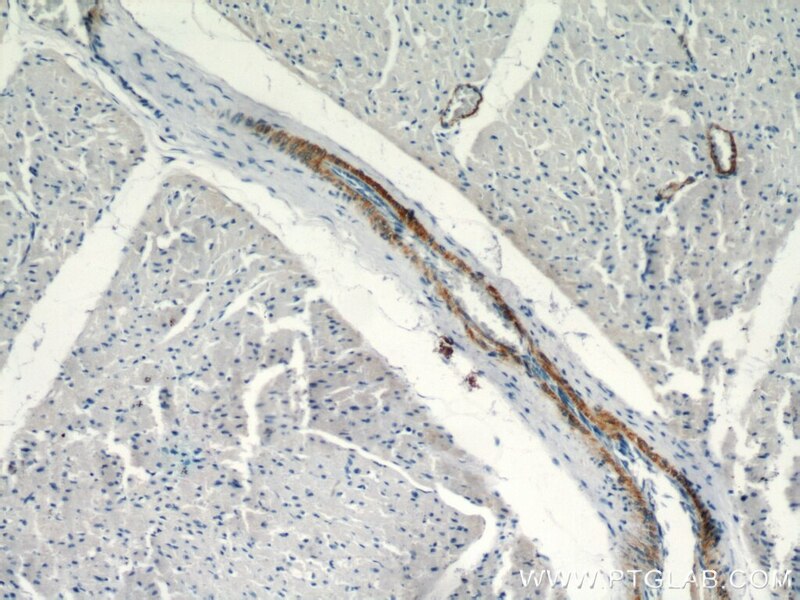 Angiotensin II as a Morphogenic Cytokine Stimulating Fibrogenesis of Human Tenon's Capsule Fibroblasts. 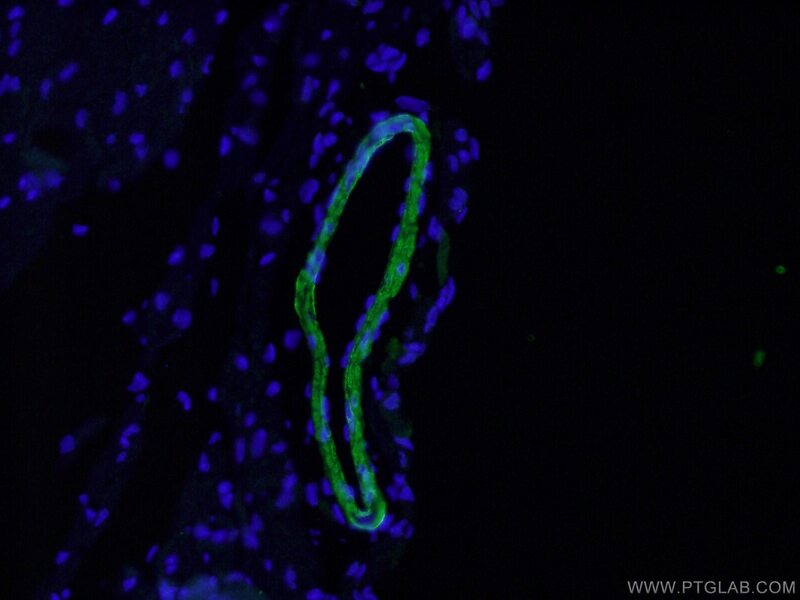 5-Aminolevulinic Acid-Mediated Sonodynamic Therapy Promotes Phenotypic Switching from Dedifferentiated to Differentiated Phenotype via Reactive Oxygen Species and p38 Mitogen-Activated Protein Kinase in Vascular Smooth Muscle Cells. 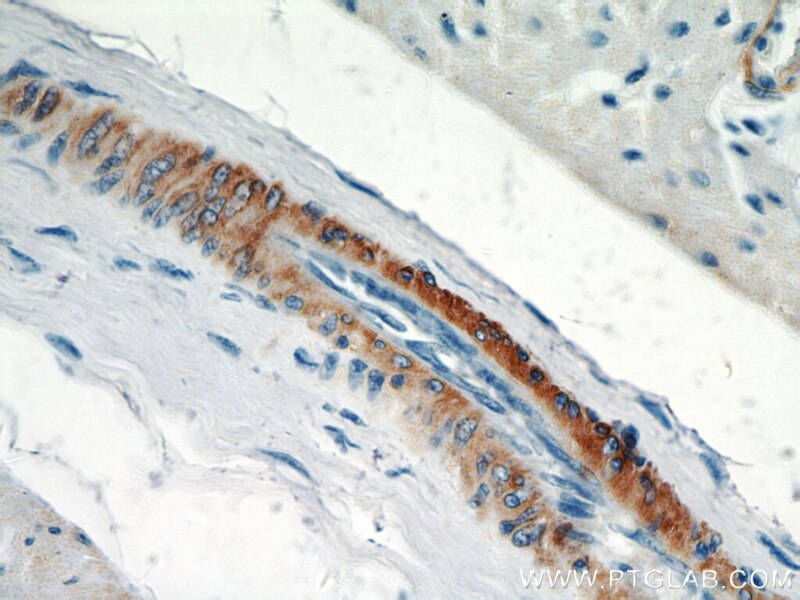 Optimization of intrinsic and extrinsic tendon healing through controllable water-soluble mitomycin-C release from electrospun fibers by mediating adhesion-related gene expression. 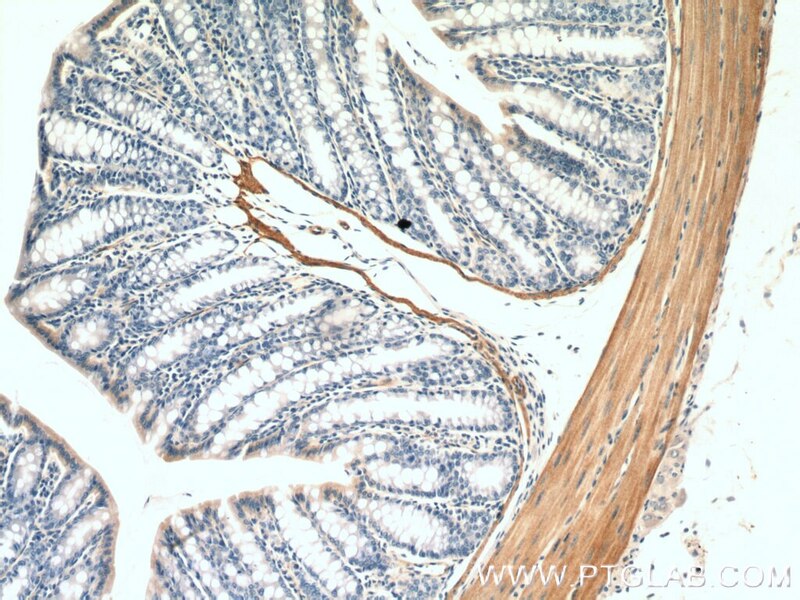 MicroRNA-130a and -130b enhance activation of hepatic stellate cells by suppressing PPARγ expression: A rat fibrosis model study. 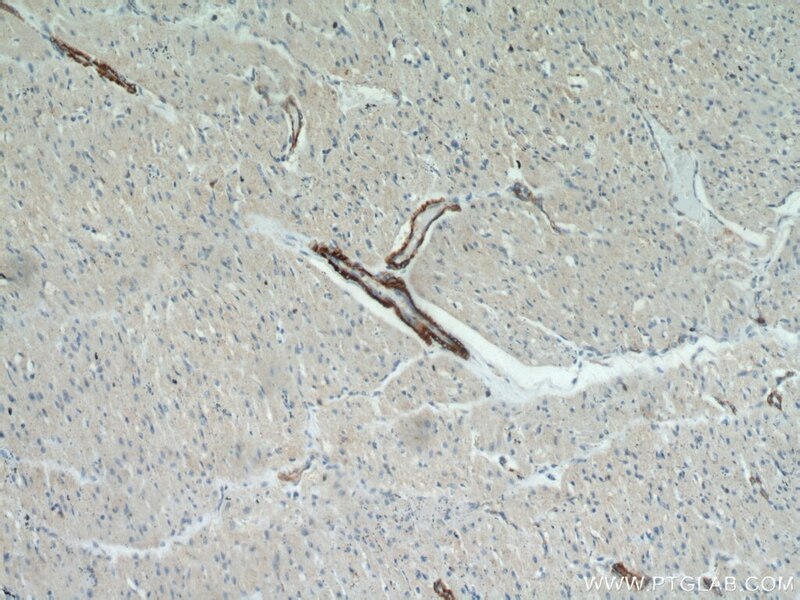 Hotair facilitates hepatic stellate cells activation and fibrogenesis in the liver. 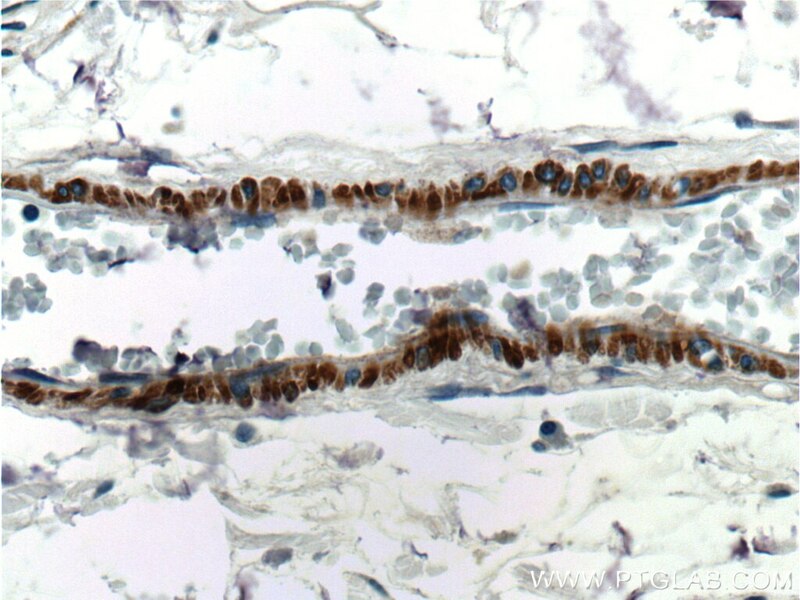 Protective effects of aloperine on monocrotaline-induced pulmonary hypertension in rats. 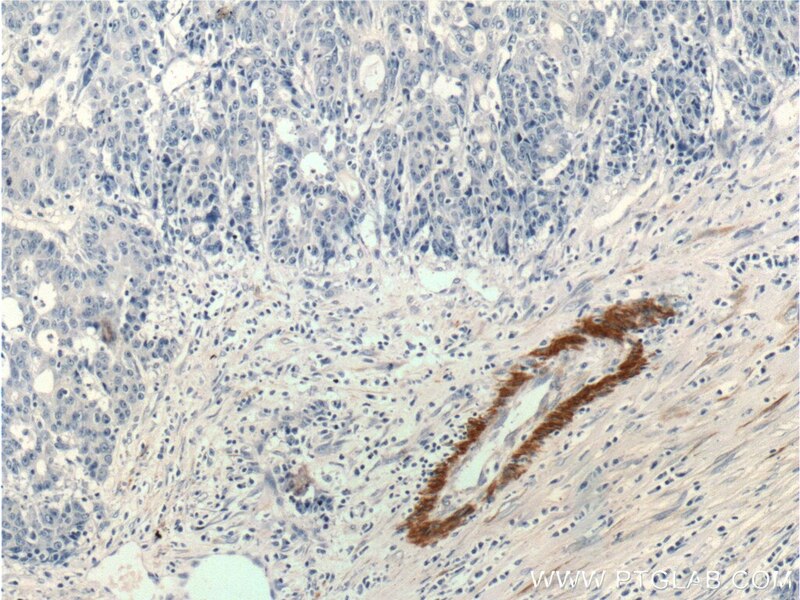 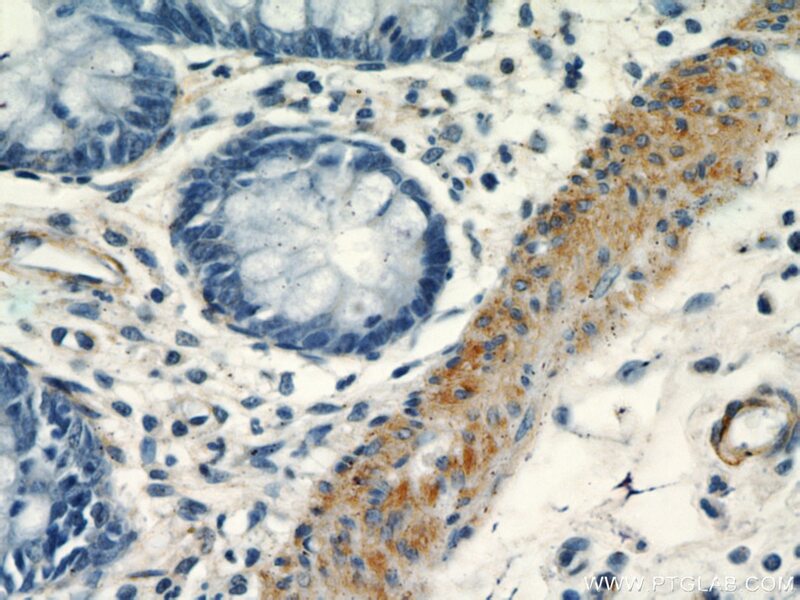 Immunohistochemical analysis of paraffin-embedded human colon cancer tissue slide using 55135-1-AP( Alpha SMA-specific antibody at dilution of 1:2000 (under 10x lens). 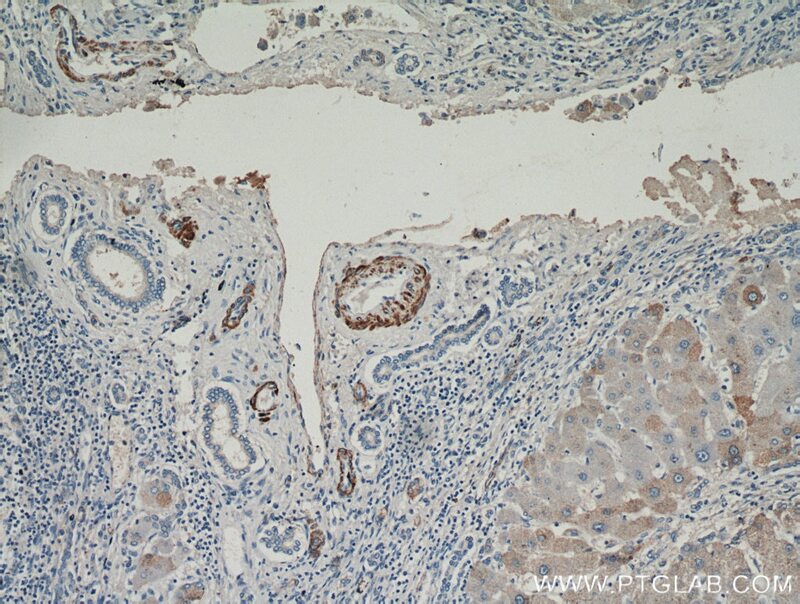 Immunohistochemical analysis of paraffin-embedded human colon cancer tissue slide using 55135-1-AP( Alpha SMA-specific antibody at dilution of 1:2000 (under 40x lens). 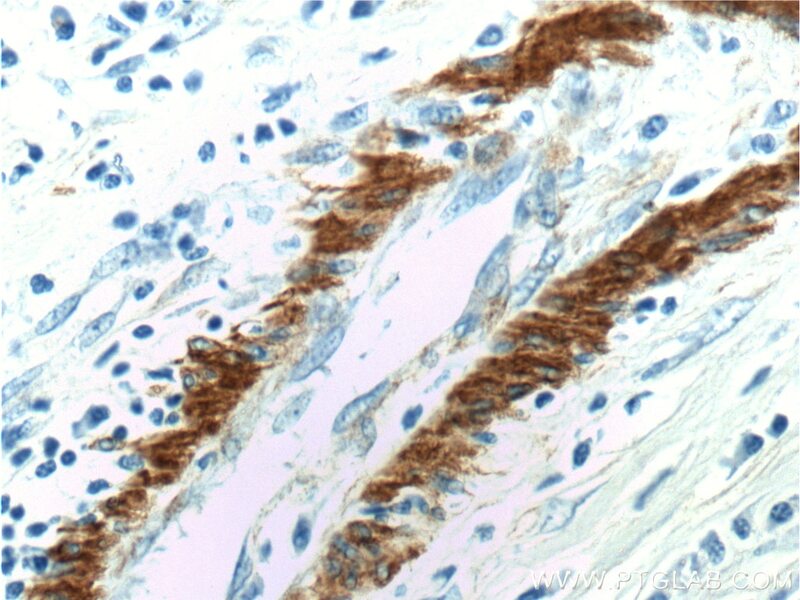 Immunohistochemical analysis of paraffin-embedded human colon tissue slide using 55135-1-AP( Alpha SMA-specific antibody at dilution of 1:2000 (under 10x lens). 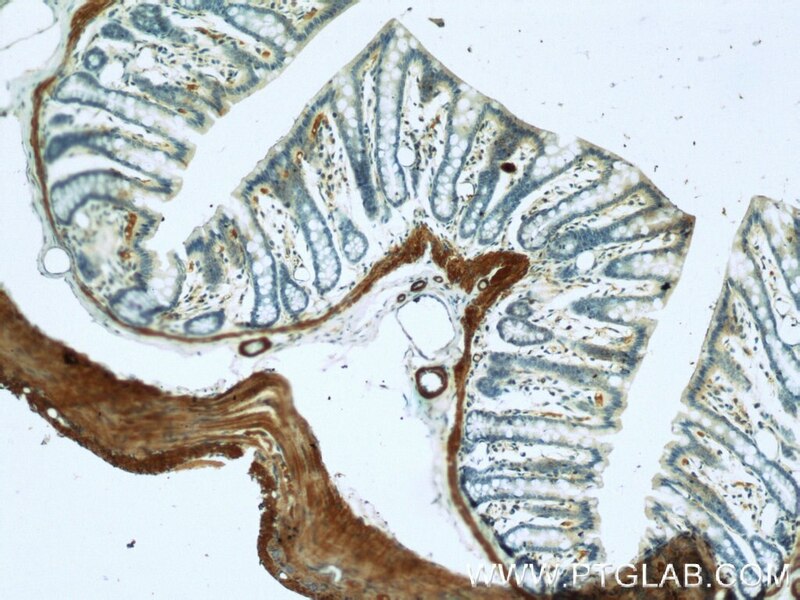 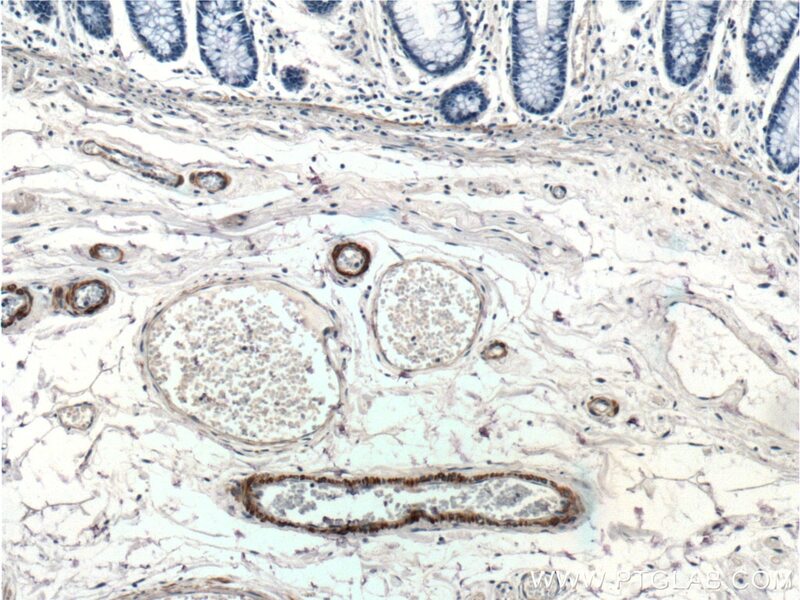 Immunohistochemical analysis of paraffin-embedded human colon tissue slide using 55135-1-AP( Alpha SMA-specific antibody at dilution of 1:2000 (under 40x lens). 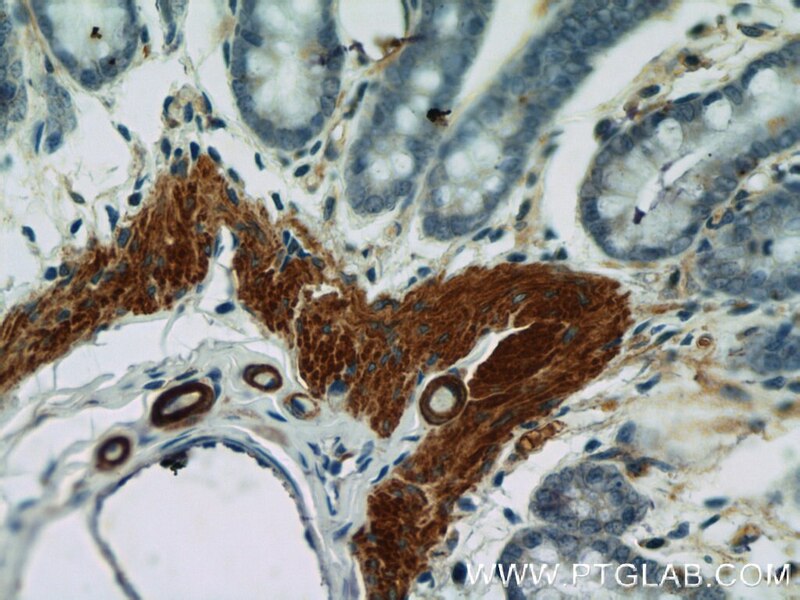 Immunohistochemical analysis of paraffin-embedded mouse colon tissue slide using 55135-1-AP (Alpha SMA-specific antibody) at dilution of 1:2000 (under 10x lens). 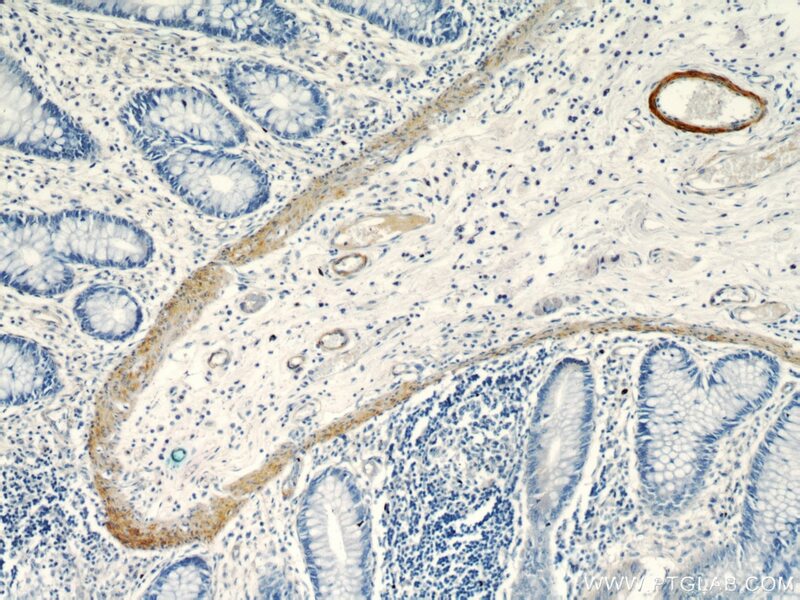 Immunohistochemical analysis of paraffin-embedded mouse colon tissue slide using 55135-1-AP (Alpha SMA-specific antibody) at dilution of 1:2000 (under 40x lens). 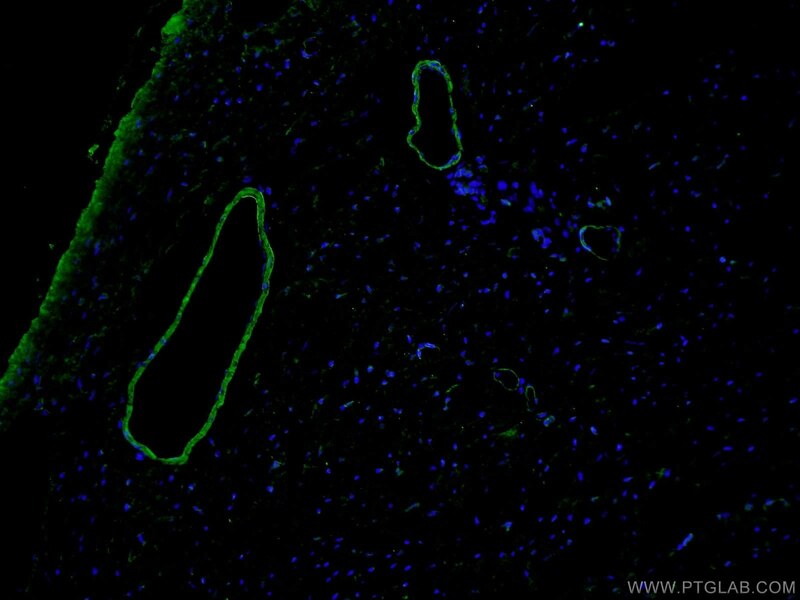 Immunohistochemical analysis of paraffin-embedded mouse liver tissue slide using 55135-1-AP (Alpha SMA-specific antibody) at dilution of 1:1000 (under 10x lens) heat mediated antigen retrieved with Tris-EDTA buffer(pH9). 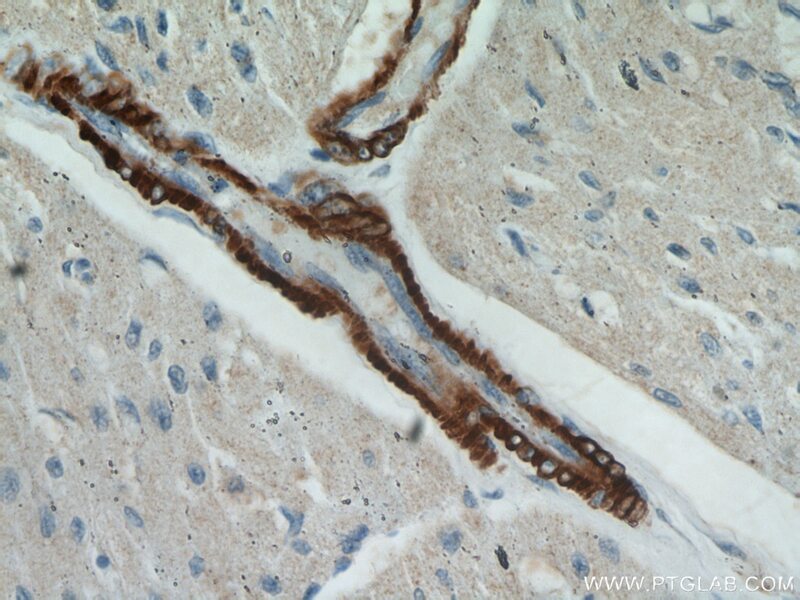 Immunohistochemical analysis of paraffin-embedded mouse liver tissue slide using 55135-1-AP (Alpha SMA-specific antibody) at dilution of 1:1000 (under 40x lens) heat mediated antigen retrieved with Tris-EDTA buffer(pH9).